Anaesthesia stops you feeling pain and other sensations. Local anaesthesia involves injections which numb a small part of your body. You stay conscious but free from pain. Regional anaesthesia involves injections which numb a larger or deeper part of the body. You stay conscious but free from pain. 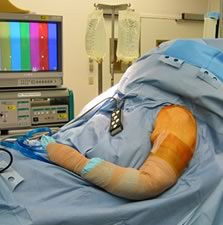 The most common regional anaesthetic for Shoulder surgery is an Interscalene Block. General anaesthesia gives a state of controlled unconsciousness. It is essential for some operations. You are unconscious and feel nothing. We generally use a combination of a General anaesthetic and a Local anaesthetic or Interscalene block. This ensures the best post-operative pain relief is achieved and you can go home earlier. Your anaesthetist will see you before your operation and discuss your anaesthetic with you. Please indicate any preferences and concerns then. If you would like to meet your anaesthetist before the day of your operation please let us know and we can arrange it for you. An Interscalene block (ISB) is a nerve block in the neck used to provide excellent pain relief for shoulder surgery carried out under general anaesthesia. It numbs the main nerve bundles that affects the shoulder in the same way a dentist uses an injection to numb a tooth or part of your mouth. The Anaesthetist, surgeon and you need to decide jointly whether you are suitable for an ISB. If you have any problems with your diaphragm (muscle used in breathing) on the opposite side of surgery or any weakness or paralysis in the opposite arm to surgery, you may not be suitable for an ISB. You will usually already be under anaesthetic before the ISB is done, although sometimes it is done whilst you are awake. If you have an ISB performed whilst you are awake, the Anaesthetist may give you some light sedation to help you to relax. A special needle with a small electric pulse is used to locate the correct nerves. 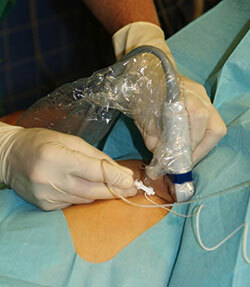 To judge the position of the injection, the anaesthetist looks for muscle twitches in the arm. When the Anaesthetist is happy with the position of the needle, he or she injects some local anaesthetic. The arm and shoulder soon becomes heavy and numb. The anaesthetist will test the numbness of the arm before proceeding further. The main nerve block technique used in shoulder surgery is a single injection that lasts 12-24 hours. After leaving the hospital, it is extremely important that you take regular pain killers at the prescribed times from the moment of discharge. This is to avoid unpleasant pain at the time when the nerve block begins to wear off (which can be in the middle of the night). Pain killers are in the form of regular paracetamol and ibuprofen, and codeine if required (if there is no reason why you cannot take these particular pain killers). You should carry the “numb” arm in an arm sling until normal sensation and motor function return. You should receive instructions about how to look after the shoulder and arm - it should be protected from heat or pressure injury and extremes of movement. You should take care not be come in contact with extremely hot or cold items because you will not be able to protect yourself from injuries of extremes of temperature. Most side effects are related to the local anaesthetic spreading and numbing the nerves adjacent to the ones that supply the shoulder and arm. Any or all of the following can occur, but all resolve spontaneously as the effects of the local anaesthetic wear off. Shortness of breath - The injection in the neck can also numb half of the diaphragm (a muscle used in breathing). Some people can feel slightly short of breath, although in most this does not affect greatly the ability to breath adequately. Blurred vision (Horner’s syndrome) - 20%. This is seen as a drooping eyelid and slightly blurred vision on the side of the block and it is usually not a problem. Symptoms pass as the block wears off. Hoarseness - 15%. Due to the nerves supplying the voice box being numbed. This improves as the local anaesthetic wears off. Difficulty swallowing water - 15%. Due to nerves supplying the voice box and throat being numbed. This effect can usually be overcome by “conscious” swallowing and usually it is not a problem. These are the result of the needle being inserted either in the wrong direction or too far. They are both extremely rare and easily dealt with, with little no after effects. Punctured lung (pneumothorax) - Due to the needle piercing the lining of the lung causing it to collapse. If it occurs, admission to hospital while it resolves will be necessary. 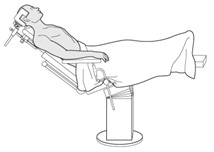 Very rarely a tube has to be placed into the chest to drain the air. 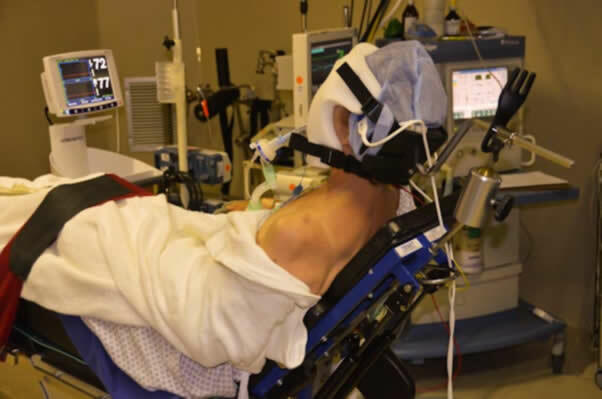 Seizures and serious long term nerve damage - less than 0.1% risk and reduced by carrying out the nerve block awake. Fortunately, the serious side effects and complications are uncommon and are lessened by placement of block with use of a nerve stimulator.